Statistics are starting to come in from the deadly outbreak of severe weather this past week. Through April 29 preliminary statistics from the Storm Prediction Center shows there have been 31 deaths from tornadoes in 2014. All of the deaths occurred April 25-28. The National Weather Service and Storm Prediction Center work to identify the location the deaths happened so as to get a better look at what may have occurred.. Homes, mobile homes, outdoors, permanent building/structure, vehicle and unknown. Twenty-four of the 31 death locations have not been categorized yet. Of the known death locations from tornadoes this year here is how the numbers break down. 57% of deaths have occurred in mobile homes. 28% of deaths have occurred in vehicles. 14% of deaths have occurred in homes. 36% of tornado related deaths occurred in mobile homes. 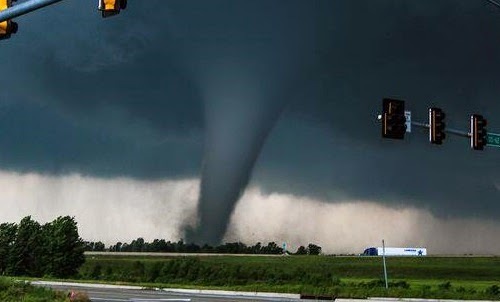 34% of tornado related deaths occurred in homes. 11% of tornado related deaths occurred in permanent buildings/structures. 8% of tornado related deaths occurred in vehicles. 2% of tornado related deaths occurred outdoors. On the surface it appears the threat in mobile home and homes is nearly identical. However, that isn't quite the same. According to the United States Census Bureau, there were 304.09-millions people living in the United States and 6.6% of the population were living in mobile homes. That works out to around 20-million people. Obviously, there are many more people living in non-mobile home domiciles. Looking at it from this perspective would suggest there is a higher threat living in a mobile home versus non-mobile home location.